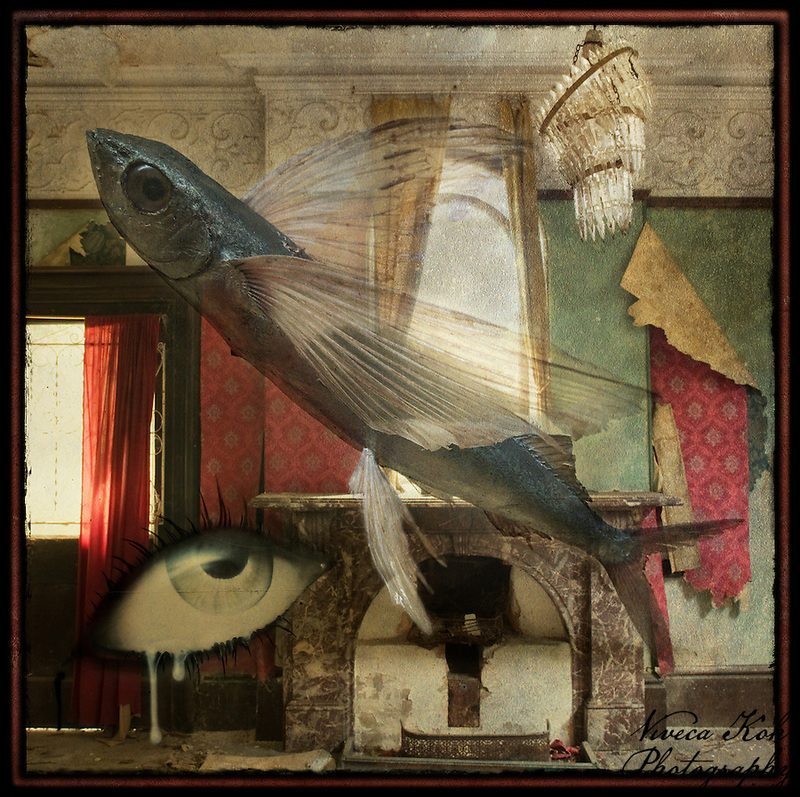 The flying fish was shot during my recent visit to the Horniman Museum, the eye was painted on a wall in the partially forsaken village of Doel in Belgium, the the background is Manor House B. The image is ten layers composited together, five of these being to create the border using textures and drop shadows, one each for the fish, the eye and the room, one for a single texture, and the final two for a hue/saturation adjustment layer and brightness/contrast. Everything was blended using layer masks in various blend modes, and the whole thing took me AGES! I would be really interested to get some feedback and constructive criticism on this one, so please let me know your thoughts if you can – much appreciated. Once again as in recent days I am experimenting with something new, as I seek to push the boundaries of my work and to continue to develop and learn to use the materials as my disposal. I am unable to decide whether or not this has worked – I think it has to some degree, but I have the feeling that I will be able to do much better if I continue to work with these ideas. This entry was posted on Saturday, November 12th, 2011 at 17:46. It is filed under Technique and tagged with Digital Image Manipulation, Fine Art, surreal, texture, Textures, UE, Urban Exploration, UrbEx. You can follow any responses to this entry through the RSS 2.0 feed. i admire your imagination and i think you’ve done an exceptional job in blending. my favorite element is the chandelier. I like this viv. The tones and textures work well together and the frame holds it all together nicely. This is really cool. Very artistic. I think you did an amazing job with the textures and overlays. Looks great! Fine, except for the bottom fin. If that could be more like the wings in transparency, the eye of viewer would not be drawn to the fireplace. It’s just a bit too in your face. Haha, awesome shot!! I fondly remember watching these flying fish from the bridge of my destroyer when I was on sea duty for the Navy. Very cool image V! This works nicely, the three main images go well together. You’ve managed the masking nicely too. As a whole, technically you’ve done an incredible job Viveca. I like the placement of the eye as it’s looking up at the fish. The background of the Manor House is a beautifully shot I’m just sure of the relation of the background to the fish. It is an wonderful surreal image.